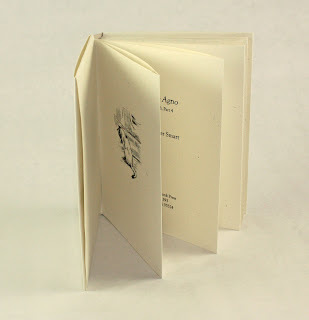 Our book arts guild is having a show next month at an antiquarian and used bookstore, Eureka Books. It should be a wild mix of things. My contribution is going to include a bottle of Codex (see previous post), but I’ve also made a few flutter books and some notepads. One of the flutter books is a copy of Jubilate Agno, or rather Fragment B of Jubilate Agno, better known as Christopher Smart’s poem about his cat Jeoffry. Jubilate Agno in its entirety was a long religious piece Smart composed while he was living in a private Georgian insane asylum called Mr. Potter’s Madhouse. Pictures of some of the other things for the show will be coming soon.